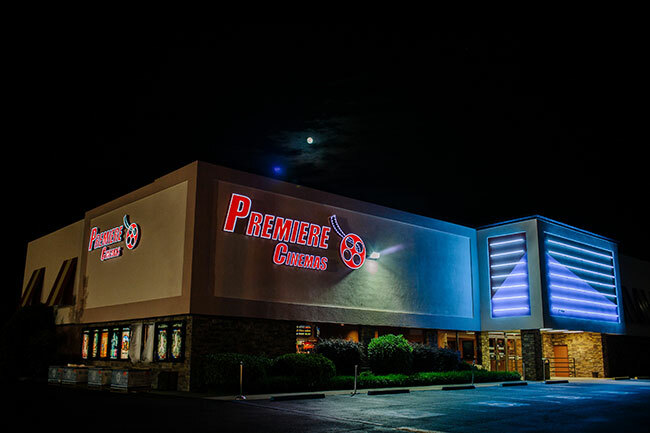 Premiere Cinena in Seneca, SC continues to show the love for neighboring Clemson University, participating in the 2016 Clemson Welcome Back Festival hosted by the Student Alumni Association. It's the fourth year for the cinema to sponsor the event which raises thousands of dollars for student scholarships annually. "Our Seneca management and staff did a tremendous job this year," said Gary Moore, President of Premiere. "Employees gave graciously of their time and talents, putting together a fun and creative exhibit to welcome back students, and entertain them at the same time. We are very proud of them all." This year's booth, manned by Premiere employees, handed out candy and hosted Popcorn Pong, a game where could play for prizes such as movie posters, Rewards Cards, and concession goodies from Premiere. Premiere staffer Grace Arndt is a sophomore theatre major at Clemson, and Judsen Hembree is in the bridge program. Seneca Premiere Director Jeremy Burrell is an avid Clemson fan and jumps at the opportunity to help the university and work with the students at every turn. Premiere's regional and I.T. Director Taylor Lanford also counts himself among Clemson alumni, having studied Business Management there from 2002 to 2007. Congratulations to all Clemson-area students and to Premiere's fabulous cast and crew for helping with a very worthwhile event.